One can almost here the narrative voice-over for the PBS special in the text itself (which of course has come and gone already, as has the HBO film based on the book starring among others Paul Giamitti, as Adams). But this is not necessarily a bad thing. McCullough’s book is a straightforward biography, focusing on both the great events in the eventful life of his subject (Revolution, embassies abroad, Vice-Presidency and Presidency, etc.) but also on his personal life (his relationship with his family, in particular his wife Abigail, and his friendships, above all with Jefferson, get most of the attention here.) It may sound snobbish, but the book is not really history in any meaningful sense. McCullough is a storyteller, not an historian, and he wants to tell the traditional patriotic story of the Founding of the Republic (the triumph of liberty over tyranny, etc.) and the story of (one of) the Great Men who made it happen. He makes no bones about this, and I imagine McCullough would probably rather be known as a storyteller than an historian anway. Still, as long as you don’t confuse his stories with history, his book serves a valuable purpose. What purpose is that? First all, let it be said, that though it is really a story and not a history, John Adams is a historically sensitive books in many ways. McCullough from the looks of it has scoured the Adams library for letters diaries and the like, coming up with all the delightful vignettes which he is known for producing(he is the master of the vignette, or what Ross McKibbin, an modern English historian called David Cannadine, the master of the “higher anecdotage.”) And he does justice to what I take to be the traditional picture of the man, at least as regards the Revolution. That is indeed its strong suit: it does for the lay middlebrow audience what Bailyn’s Ideological Origins of the American Revolution did lo those many years ago, which is give the traditional narrative a new caché (though others, such as Joseph Ellis, are probably more important in this regard). It is certainly not an intellectual biography, and no one at this point in the academic world seems to have done the definitive study of his thought (Bradley Thompson seems to be the best, from what I can tell). But it does give a general sense of who the man was, and it is this that I want to focus on, because I believe, surprise of surprises, McCullough’s picture might reveal something about how attitudes toward eternity changed in his lifetime. McCullough actually acknowleges the truth of the underlined passages, but never really pursues their possible conclusions. He never really tries to resolve the various contradictions in Adams personality or thought, or where they might come or what beliefs might condition them or from which they may have arisen. The whole book is peppered with wonderful observations and quotes from or about Adams, like the one above. Adams begins by taking a look at his childhood, schooling and then his law practice prior to becoming involved in the politics of the 1760’s which led up to the Revolution. One wishes he had spent a little more time on his education, on what it actually consisted of, as well as on what he had read. McCullough does talk about this but only in a general way, dropping names like Virigil or Blackstone when wanting to illustrate his learning, but never going into detail. Again, this is not really a big deal, as he is trying to deliver his whole life, and does a fine job of it for the most part, especially given the fact that he naturally had to spend lots of time on the biggest events, i.e. the Revolution and his presidency. But nonetheless, we don’t really get a sense of what he took from the classical authors, other than an admiration for Stoic self-control. Once McCullough comes to the part of his life which leads to Revolution, he is already fully formed as the self-made, Puritan descendant who has put away self-doubt to become an important figure, and we know of his ambition, which perhaps as some reviewers have suggested McCullough has underplayed. That aside, what I would like to know more about is the process by which his mind was formed and by which ideas, which ones played the largest role in giving his thought whatever overall coherence and unity it may have had (or didn’t have, as the case may be), since these were the ideas and beliefs that would ultimately lead him to be, at least in McCullough’s telling, one of the most adamant proponents of independence and opponents of conciliation with the British government. What I am really complaining about, of course, is his discussion of Adams’ religious beliefs, which directly relate of course to his what his idea of eternity must have been. He talks about his church and where he worshipped briefly, but rarely does McCullough give any indications of Adams’ theological beliefs, or of how they shaped his views, though at times he quotes Adams giving some hint of what this influence might have been. He quotes his diary as saying (in 1756) that “I am resolved to rise with the sun and to study Scripture on Thursday, Friday, Saturday, and Sunday mornings,” but does not tell us what he took from it, or how he riead it. (41) At one point discussing Adams’ reaction to Thomas Paine’s Common Sense, in relation to Paine’s attempt to use the Bible to argue that hereditary monarchy was unnatural, “struck Adams as ridiculous.” (97) But why did he think this was ridiculous? McCullough surely know that Scriptural arguments had always been used in debates like these, certainly in the 18th century. Why then did Adams react the way he did? I have similar questions with they way he portrays his view of human nature, which bears directly of course on his view of government. 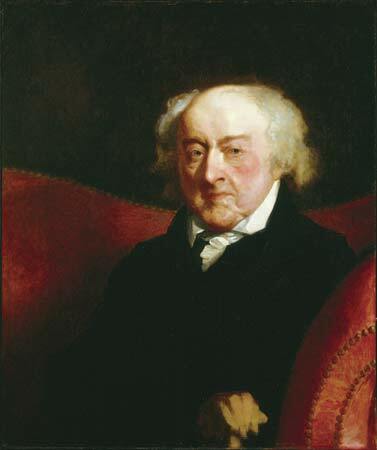 At one point, speaking of his friend Eldridge Gerry, McCullough tells us that Adams “viewed makind as capable of both great good and great evil. Importantly now, they were also of the same heart about what to be done at Philadelphia.” (p 75) McCullough repeatedly stresses what he takes to Adams’ cautionary view of human nature as sinful, and quotes Abigail (whose views are largely consonant with his) as saying in a letter that “I am more and more convinced that man is a dangerous creature, and that whether power is vested in many or in a few, is ever grasping.” (101) Mcullough asserts that Adams believes this also, and that this is why he put so much stress on checks and balances in government. But the impression one gets from him that Adams believed this in a very general way, as if he believed in it as an abstract explanation for explaining in a broad sense the bad things people do, but in his interactions with actual human beings he seems much more sanguine about their natures, as if somehow all his friends were spared the general wickedness of mankind. Indeed to me this begs the question: if mankind is so untrustworthy, what made the Founders, himself included, exempt from the general indictment of universal perfidy, able to recast government in a better mold than their ancestors, who were presumably no more or less wicked than they? McCullough never asks this question, but other things he points out might suggest an answer. All of this begs a thousand questions: if he trusted in providence so much, what difference did it make if one person or thousand exercised the “unbounded power” of sovereignty he evidently thought necessary for government? What in fact made him so sure that independence was preordained? 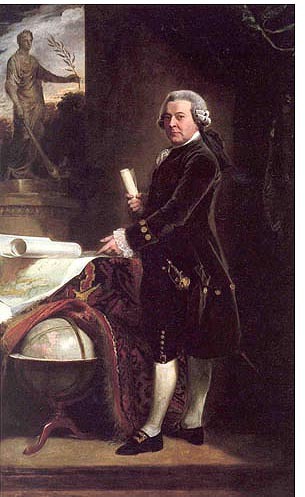 Where in short did his religious beliefs come from, and what were his theological reasons for holding those beliefs, and how did they affect his judgment of the situation between the colonies and the British government? Adams seems to have thought that independence was something gifted to the American colonies before the foundation of the world, but McCullough gives us no hint as to how he arrived at such a conclusion. He merely narrates it in admittedly splendid fashion. I say this because Adams (so McCullough tells us) was portrayed by English newspapers as a “fanatic,” when he clearly was not, but this doesn’t mean he wasn’t motivated by his religion. 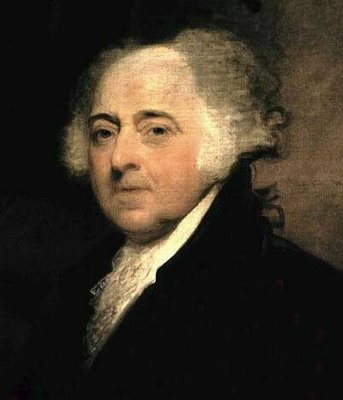 More to the point, being a learned person, Adams almost assuredly had reasons for his beliefs, theological reasons that he held self consciously and would certainly have had an impact on his view of government. What difference might it have made to known that Adams was likely an Arian (that is, he denied the full divinity of Christ); or that in his Thoughts on Government, he invokes the names of none other than John Milton and Algernon Sidney (along with other partisans of the Good Old Cause) among the sources of his beliefs on government? I think it might have made quite a difference. But then it wouldn’t be the traditional patriotic narrative. Now, I don’t want to make too much of this passage, given its context, which is Adams toward the end of his life, when he had to deal with the loss of grandchildren and children, then soon also his beloved wife Abigail. But it seems to me to indicate not merely his griefs in old age or his alleged pessimissim about mankind, so much as his reductive, this wordly view of religion, in that in embodies what I take to be a rather modern emphasis on moral conduct as the true core of religion, a la Kant and much contemporary Evangelical understanding of Christian belief. Religion is mainly right conduct–that is to say, activity rather than contemplation (though to be fair, Adams standards of what counts as this right conduct is much more demanding than his spiritual descendants, who seem to think the only criteria for salvation consists in “being nice” and not offending people, no matter what.) Perhaps I am conflating an emphasis on morality and the this wordly benefits of Christian belief with the notion of active life drowning out any sort of contemplation; nonetheless, all I have to go on so far is McCullough’s biography, and Adams seems to exemplify this pretty thoroughly. But so what? Well, for starters, I think it illustrates how his theological beliefs shaped the way he viewed the world as a whole, and how, as a part of this whole, it necessarily affected his thinking about government. Let take one example from his writings that McCullough does not quote from. In the preface to his work A Defence of the Constitutions of the United States of America, Adams sought to defend the various governments of the nascent republic from charges of inadequacy by European philosophers. He has many interesting things to say, but the important passages are these. They come in the context of Adams assertion that ancient pagan civilizations all associated law-giving and therefore government with divinity, “their emperors and nobles all being descended from their gods,” obscuring what he sees as the truth about government, which the founders of the United States have finally brought to light. The passages seem to come to a curious conclusion, don’t they? All the build up, contrasting ancient religions with their politicians descended from gods and the robust good sense of the American people (singular, interesting) who used only their reason and senses build the world anew, as it were, culminates with the passage I underlined about the “Christian religion, without the monkery of priests.” This seems contradictory at first; isn’t he arguing, in good Enlightenment fashion, for a purely natural politics, divorced from religion? This type of thing is what makes it possible for all those popular authors to hawk their idiotic books about the religion of the founders: yes they were good bible toting Christians, no they were radical free-thinkers, etc. What Adams says here is either deviously brilliant, or studiously ignorant, perhaps a bit of both. The key is in the middle passage, about how the Americans are not taken in by “the pious mystery of holy oil.” This is a reference to the custom, now nearly defunct, of anointing European kings after the manner of the kings of Israel in the Old Testament, a practice which went back as far as the fifth century. The practice was rooted in an effort by the Church to tacitly assert its authority over barbarian kings, thereby claiming to give them legitimacy and therefore divine sanction. Adams subtly associates this practice with the ancient paga practice of worshipping their emperors as gods, repeating a Protestant and Englightenment shibboleth about the middle ages, namely that it was mostly paganism dressed up in the clothes of Christianity. (At the end of the preface, he specifically cites Hume and Gibbon as having given “admirable accounts of the feudal institutions, and their consequences,” that is, shown how superstitious and primitive they were, xvii.) What Adams objects to, of course, is that the Church or any Christian body can give such sanction, or that in fact human government needs such sanction to ensure its success, and this seems totally obvious to most people today of course. But it seemed so to John Adams for quite different reason than many do today, as the obvious conclusion about all the obvious truths about politics and government that we take them to be. The reason, I would argue, lies in his theological beliefs, for Adams, as my advisor informs me, was an Arian, that is, a Christian who acknowledges Jesus’ divinity but not his Godhood: that is to say, Jesus was a divine creature sent by God to mankind, but he was not God himself. What could this possibly have to do with the American Revolution? Well, if God himself was actually present on earth, he could found an institution (i.e. Church), and grant his authority to it; and that institution could in turn, use its authority to proclaim civic government as being consonant or not consonant with God’s will. Hence Arianism, assuming that was the belief Adams held, would have been a perfect solvent for disowning one’s obedience to a government which claimed, however obliquely, a divine sanction to rule: it could make possible the claim that government needed no divine sanction to be the true Christian position and that any government which claimed such divine sanction (religious or civil) was by definition not Christian, indeed anti-Christian–or to use the contemporary phrase, which was hurled at the British Government (and George III personally), it would be “popish.” If this indeed was the case, it no doubt alters the relationship of eternity to time in the Western mind, for if one accepts this position then you have to explain it another way, as God had not, as orthodox Christianity has always held, been personally present on earth to define such a relationship. There is a parallel to be made here in the realm of science; writers have long been fond of comparing the American constitution to Newton’s mechanistic theory of the universe, as both have been portrayed as “going back to nature,” if you will, against the absurdities of scholastic science on the one hand and of “monkish” forms of government on the other, as Adams puts it. But as scholars such as Betty Jo Dobbs have long since established, it was precisely Newton’s Arianism which spurred him both to devise his mechanistic theory of the universe (which votaries of “modernity” love) and to his researches into alchemy (which embarasses them to no end), mainly because his theological beliefs demanded he see not only God’s relationship to nature differently but also human beings relationship to nature differently as well. And if Adams was motivated by the same belief, then the parallel with Newton is more apt than his admirers suspect, and probably more than they would like I imagine. This digression has taken me far from the book I’m afraid, but it helps capture my reaction to Adams, which is quite ambivalent. As a person, I find him intriguing, even fascinating; I find his beliefs, if they are as McCullough has described, naive to the point of delusion. In the end, though, one simply has to stand amazed and acknowledge his greatness despite all its ambivalence. (I recall that Burke gave such an ambivalent compliment to Oliver Cromwell in Reflections on the Revolution in France, calling him “one of the great bad men of history.”) The real vision of eternity that Adams espoused was not a return to the “natural” forms of government, free of monkish superstition; rather it was his eternal optimism about human nature and the alleged achievements of the American government that was really eternal. At the end his biography, McCullough, despite recounting his supposed cautions about the vagaries of human nature, records that Adams “felt he had lived in the greatest times, that the eighteenth century, as he told Jefferson, was for all its errors and vices “the most honorable” to human nature. “Knowledge and virtues were increased and diffused; arts, sciences useful to man, ameliorating their condition, were improved, more than in any period”…his confidence in the future of the country he had served so long and dutifully was, in the final years of his life, greater than ever…once, in a letter to his old friend Francis van der Kamp, he had written,” Griefs upon griefs! Disappointments upon disappointments. What then? This is a gay, merry world notwithstanding.” It could have been his epitaph.” (650-1) There were other voices, of course, and not every founder believed that the “institutions now made in America will never wholly wear out for thousands of years,” and it would be interesting to compare his thoughts with those of his great grandson, Henry Adams, whose autobiography seems to be a eulogy for the vanished spirit of optimism so prevalent in his famous ancestor. (Especially interesting in this regard is the chapter on Darwin in The Education of Henry Adams; see also his chapter on the industrial age versus the middle ages, “The Virgin and the Dynamo,” where he takes a decidedly different view of the “feudal” world than John Adams did.) Whatever makes of John Adams or his beliefs, McCullough’s biography is an elegant paean to a peculiar kind of greatness, and well evokes the times when such titanic personalities still roamed the earth. ~ by Alypius on July 27, 2008. That was a great post! Even though I’m a fan of McCullough, I do think that he romanticizes his subjects. Thanks for the comment, especially since you are the first one to do so on my blog. I don’t think McCullough romanticizes Adams so much as simply takes on faith everything he says,without examining his beliefs further. I’m surprised that I am the first to comment on your blog. It’s very interesting and well-thought out. If you’re looking for a different point of view on Adams (and others), I recommend Descent from Glory by Paul C. Nagel. I think he is too harsh at times, but doesn’t dumb down their faults like McCullough.